Hey everyone, hopefully your all prepared for the experience of a lifetime, as the 2011 Motoscape Banger Rally starts in just over 2 weeks! Here at Motoscape HQ, we can’t believe how quickly this year’s rally has come round. It doesn’t seem like 2 minutes since we were enjoying the first beer in St Omer 12 months ago. We hope all your preparation is going to plan and can’t wait to see your motoring masterpieces! If you can’t wait till the 3rd of September to show off your banger, why not post it on the facebook page for all to see! And most importantly of all, your team and your car! This year we are going to be updating the website constantly with updates from the rally. Every day there will be a blog on the latest rally news, challenges, leader boards, photos and general daily goings on. This will be the main hub for all the latest news & photos with instant updates to their news feeds so pass it on. We want this years rally to be the best one yet and we hope you are all as excited as we are! 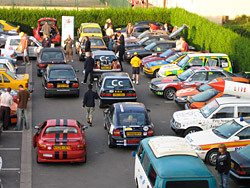 The Motoscape Team will be at the Etap Hotel in St Omer from 11am on Saturday 3rd September ready for registration!